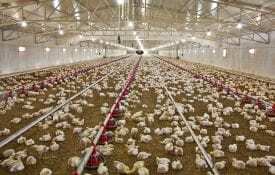 Feed costs represent between 60 and 70 percent of production costs in poultry and livestock diets. Therefore, improving feed utilization has a tremendous impact on production costs. Poultry producers face the challenge of finding cost-effective nutritional and processing strategies in order to remain profitable. Particle size reduction during grinding increases the surface area of feed ingredients, which increases the interaction of the ingredients with digestive enzymes, improves mixing characteristics, and reduces nutrient segregation during handling, particularly in mash diets. However, excessively fine grinding can increase grinding costs, lead to dust pollution and moisture losses, and cause flowability problems during feed manufacturing. In broiler diets, the addition of finely ground ingredients has been associated with increased gastrointestinal passage rate, poor gut health, and low nutrient digestibility. 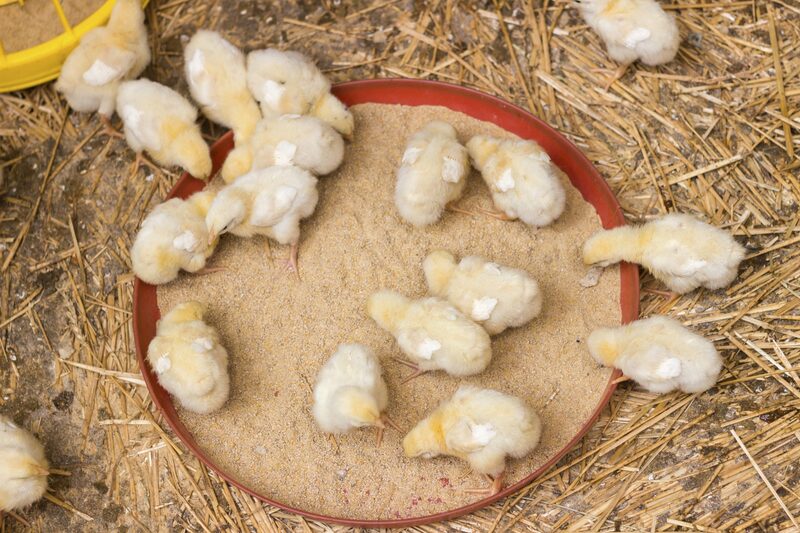 The effect of ingredient particle size in poultry diets is complex and is influenced by a number of factors, such as age, grain type, grinding method, and particle size distribution. Whole grains or coarsely ground ingredients have been reported to influence gastro intestinal tract (GIT) function and gizzard development as well as reverse peristalsis. A well-developed gizzard improves gut motility, increases retention time of the feed in the GIT, promotes better digestion and absorption of nutrients in the upper gut, and reduces the risks of coccidiosis and other enteric diseases in the lower gut. In addition, feeding whole grains or coarsely ground ingredients reduces proventricular swelling. Figure 1. Average particle size and particle size distribution of mash diets prior to pelleting with either 0 or 50 percent coarse corn addition. Tests on two levels of coarse corn (0 and 50 percent) during the grower and finisher period have indicated that the inclusion level of coarse corn was obtained by replacing 0 or 50 percent of the total dietary corn with coarse corn (1,359 μm) in a basal diet that contained fine corn (294 μm). As 50 percent coarse corn replaced fine corn, the average particle size of the mash diet prior to pelleting increased from 432 μm to 640 μm in the grower diets and from 389 to 651 μm in the finisher diets and produced a bimodal particle size distribution (figure 1). In this study, pellets were screened to remove the variability caused by pellet fines on growth performance. The addition of 50 percent coarse corn significantly improved feed efficiency during the grower and finisher periods (table 1). The improvement in feed efficiency when 50 percent coarse corn replaced fine corn appeared to be associated with better nitrogen and energy digestibility. The improvement in nutrient digestibility when coarse particles are fed has been reported in several studies. Furthermore, the addition of 50 percent coarse corn increased relative and absolute gizzard weight, reduced relative proventriculus weight, and produced an improved compartmentalization between gizzard and proventriculus (figure 2). Increased gizzard development is a consequence of increased grinding activity through the addition of coarse corn or other structural material. The improved compartmentalization suggests a better balance between the enzymatic activity and acid secretion in the proventriculus and grinding activity in the gizzard, which results in better nutrient digestion. Studies show that the addition of coarse corn had an effect on litter condition (nitrogen, moisture, and pH). A decrease in litter nitrogen of 8.47 percent was reported when 50 percent coarse corn replaced the fine corn. The reduction of nitrogen in the litter is important to reduce the incidence of footpad dermatitis, particularly in conditions of high litter moisture. The particle size of SBM has also been shown to influence broiler performance. 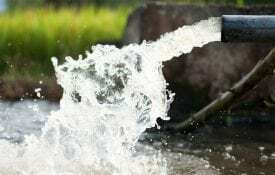 A 2004 study reported an improvement in mineral digestibility when the particle size of SBM increased from 891 μm to 1,239 μm. A 2013 study evaluated the effect of SBM source (solvent extracted and expeller extracted) and particle size (coarse–1,330 μm and fine–520 μm) on broiler performance from 1 to 49 days old. Authors of the study reported a higher body weight and improved feed efficiency at 35 and 49 days old when birds were feed coarse SBM. There was an interaction between SBMsource and particle size on body weight at 49 days old. No differences in body weight were observed when birds were fed solvent-extracted and expeller-extracted SBM in a coarse ground form. However, grinding the expeller-extracted SBM depressed body weight at 49 days. 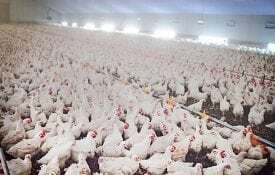 with different levels of trypsin inhibitors units on broiler body weight at 14 d of age. Subsequently, a 2014 experiment was conducted to evaluate the effect of particle size (530 and 1300 μm) and trypsin inhibitor levels of expeller-extracted SBM on growth performance of chicks from 1 to 14 days. Increasing the particle size of expeller-extracted SBM improved growth performance, especially when the trypsin inhibitor level was greater than 9 TIU/mg (figure 3). It is theorized that coarse grinding of expeller-extracted SBM increased gastric reverse peristalsis (gizzard and proventriculus) and caused acid denaturation of trypsin inhibitors, increased bile movement into the gizzard, released trypsin inhibitors more slowly or consistently, and, consequently, provided the chick with the opportunity to adapt. Although there are multiple benefits of feeding coarse particles, the age and the size of the birds are important when deciding on particle size. Newly hatched chicks can have problems consuming whole grains or coarse particles, an issue directly influenced by beak size. A 2004 study reported a significant decrease in body weight gain at 7 and 15 days when the particle size of corn in diets fed to poults increased from 606 to 1,094 μm. Moreover, other studies show that chicks fed whole wheat had lower body weight because of poorer feed consumption as compared to those receiving ground wheat. Young chicks might have difficulties swallowing the unground grain. A 2010 study reported a linear decrease in body weight gain (0 to 21 days) and poorer feed efficiency (0 to 7 days) when the particle size of corn increased from 557 to 1,387 μm. In a 2013 study, four dietary treatments evaluated SBM particle size (coarse–1,290 and fine–470 μm) and corn particle size (coarse–1,330 and fine–520 μm) in a factorial arrangement (table 2). The chicks were fed a starter diet in mash form from 1 to 19 days. Chicks fed fine SBM had a greater body weight at 19 days than chicks fed coarse SBM, primarily driven by higher feed consumption. Furthermore, chicks fed fine corn had greater body weight at 7 and 19 days, influenced by both greater feed consumption and better feed efficiency. In this study, grinding corn from 1,290 to 470 μm improved feed efficiency by 15 percent at 7 days and by 4 percent at 19 days. The inclusion of whole grain or coarse corn with an average particle size greater than 1,000 μm can reduce body weight and feed efficiency, particularly during the starter period, likely because the gizzard of newly hatched chicks is not fully developed and is unable to grind large particles as in the older bird. Further, the grinding process in the gizzard requires energy that is diverted from growth. For these reasons, it is advisable to consider incorporating large quantities of coarse materials only in later production phases. Particle size reduction is the second largest energy cost after pelleting during feed manufacturing. For this reason and those described above, sampling should be conducted and particle size analysis performed at least weekly after performing any preventive or corrective maintenance, such as changing screens, hammers, or changing rotation, as well as when the characteristics of corn may change (e.g., new crop corn). Particle size manipulation has a tremendous effect on feed costs, nutrient digestibility, animal welfare, and overall profitability of poultry operations. As described, the target particle size in poultry diets should depend on the phase of production. Starter diets should contain a small percentage of coarse particles of corn, which should then gradually increase with body weight and age. During the grower and finisher periods, the particle size of corn-SBM diets fed to broilers should be around 650 to 700 μm with approximately 20 percent of the particles being larger than 1,180 μm (bimodal distribution) to stimulate gizzard function, increase the gut retention time, improve nutrient digestibility, and promote intestinal health. Following these strategies has been shown to improve bird performance, reduce feed costs, and positively affect overall profitability. 1 Data represents means of chicks fed diets containing either 0 or 50 percent coarse corn. 1 Adapted from Pacheco et al. (2013). Download a PDF of Effects of Diet Particle Size on Poultry Performance, ANR-2289.